How was everyone's 4th of July? Sorry, I've been MIA since last Thursday...life just got in the way! We spent all day Saturday on the river, on the boat, drink in hand, soaking in the sun. Good times. Yesterday for the 4th, was spent around home during the day, and then to a barbecue later that night. I got a good 4th of July picture of the husband, little man and I, but it's on my friend's camera....so you'll just have to wait until I get it from her! 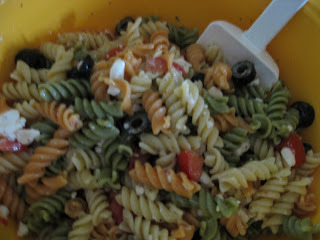 I took this new pasta salad over to our friend's house that I created. Heck, what am I kidding, I'm sure you've all had one like it. I love oil and vinegar pasta salads, as they are light and refreshing. And I also have a new love for feta - could eat it in everything! Since I had baked a lot last week, I also brought along a loaf of the best banana bread EVER. Seriously, I will never cheat on this recipe, it's just too good. What did you take to your July 4th festivities? Cook pasta to al dente. Rinse noodles under cool water and drain. In large bowl, add all ingredients and 1 c. of the dressing. Stir and chill for at least 2 hours. Before serving add additional cup of dressing and toss to coat. Today I'm off to help a friend address/write-up invitations for a baby shower we are throwing later this month, and hopefully will get off to the library to work on a writing project! Sounds like you guys had a great weekend, Ally! Gotta love a day on the water relaxing! Your pasta salad looks great...I love salads like that!! GREAT pasta salad! I celebrated Canada Day by eating fries, bbq-ing, visitng with friends and family, working in the garden and sitting in the shade. Great weekend! I'm glad yours was too. Pasta salad is always such a crowd pleaser...that's why I love it! Hope you enjoy your Monday (kind of) holiday :). 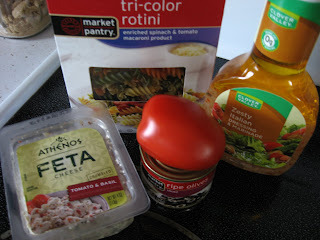 I really prefer feta in pasta salad. It seems to give it a little something special instead of cheddar. I've never used any of the flavored Athenos though and I bet that makes it even better! Yummy looking pasta salad!!!! Thanks for the banana bread recipe....I'm always making banana bread so I'd love to give a new one a try! Oh yeah everything's beta with feta! !